A perpetual state of impermanence is apparent in the pages of Transition, and depicts the confronting bleakness of a perishable realm. Absent of life, these images oscillate between the physical and psychological world; providing the perfect breeding ground for an entanglement in lucid dreams. 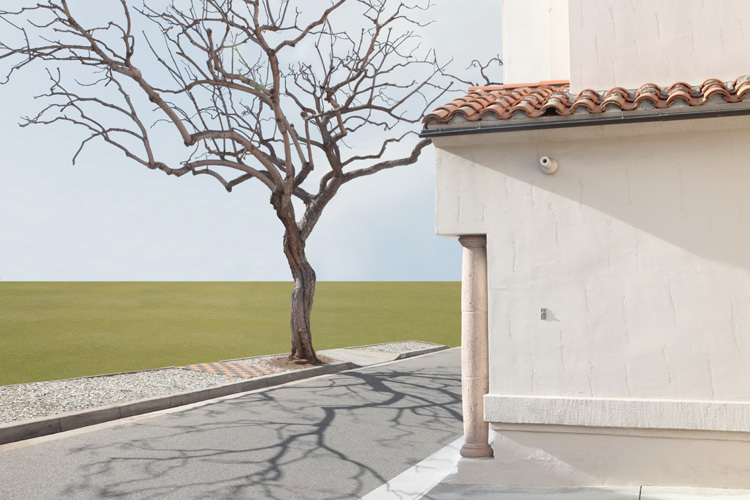 For almost ten years, photographer Lauren Marsolier has created nondescript and isolated settings. Neither here, nor there, these places are obscurely ordinary. Tidy architectural facades juxtapose illuminated social spaces, which have been offset against an abrupt black sky. These images loosely portray an openness that, surprisingly, inspires a deep sense of internal terror. Released in August 2014, Transition, published by Kerber, chronicles Marsolier’s personal experience with transition. Resembling a carefully conceived piece of futuristic fiction, this picture book is divided into three sections; the seemingly placid, hazy beginnings of her transitional phase in 2005, a more ominous period in 2007, and lastly, a clearer, grounded time in 2009. “The core of my work is to explore the phenomena of transition, both as a psychological process and a spatial condition”, Marsolier explains, “I am interested in how we experience change, how it can trigger inner conflicts and eventually affect our outlook”. In the midst of a transition, the individual can experience a loss of identity, and it is this loss of identity that is adherent in Marsolier’s images. “We become enigmas to ourselves”, Stefan Mattesich wrote, “foreigners in our own lives”. Signifiers are non-existent, subsequently eliminating the concept of the past. Additionally, the viewer can see no evidence of where they are, rendering them completely disorientated and unable to move forward or backwards. This is partly because of photomontage, where Marsolier compiles multiple photographs digitally, to create new, constructed landscapes. “These places are nowhere,” curator W.M. Hunt wrote, “They exist here as buildings somewhere at the edge of civilization”. There is a lifeless structure to these images, and despite the knowledge that these are, in fact, environments comprised of colliding atoms, it is ultimately drowned by the noise of aimless winds. “All places come to look alike, to be interchangeable with one another”, Stefan Mattesich wrote. Lauren Marsolier is a French photographer, based in Los Angeles, and has been the recipient of numerous awards, including the prestigious 2013 Houston Center for Photography fellowship. Her work has been included in the 2013 London Exhibition ‘Landmark: The Fields of Photography’ at the Somerset House, and she was recognised by the British Journal of Photography as one of ’20 photographers to watch in 2013’. On November 14, Marsolier will be signing copies of Transition at the Robert Koch Gallery Stand, at Paris Photo.